A New Column! "Shanghai Journal"
Nice to meet you all. It’s my honor to be selected to study in Shanghai, China for six months, from September, 2015 to February, 2016, under the joint public and private project, “TOBITATE (Leap for Tomorrow) Study Abroad Initiative” with the help of Michinoku Bank. While I study the Chinese language at a college, I will receive market research training at a company. During this period, I’d like to transmit information on the local lifestyle and apple-related stories. I’m not good at writing so I’d like to beg your pardon on my poor writing in advance. It’s been a month since I arrived here. The day after I arrived, when I was taking a walk on campus, I saw a cat catch a mouse. (I’ve heard of such incidents occurring in Japan decades ago, but we hardly come across such a scene nowadays.) Cats are wilder here as well. It clearly showed me that “the weakest goes to the wall.” Also, some old ladies often get in a line unfairly. I learned that I need to always take a step forward in this culture, not waiting to be served all the time. 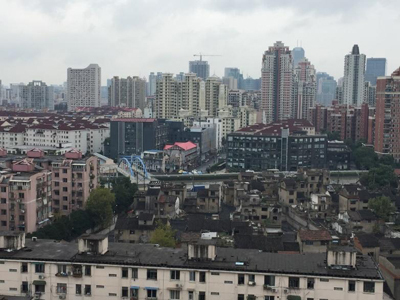 ▲The street view of Shanghai from the dorm. It’s only a 5-minute walk from the campus to the nearest subway station which has a huge shopping mall. Now it has become a happy place of “shelter” for me, where I can go to a supermarket called TESCO, a UK-affiliated company. There are many shopping malls in Shanghai located right in station buildings with many foreign-affiliated shops. They are extremely crowded on weekends and owing to the shortage of parking lots, the streets in the area are jammed. The citizens are complaining about this problem. Now I’d like to talk a little about apple scenes in China. As many of you may know, the amount of apples produced in China is the highest in the world, which is about 50 times more than Japan and is equivalent to half of the world’s produce. Domestically the main growing districts are Shandong, Shaanxi, and Henan provinces. At the supermarkets I visited, I found apples from these provinces as well as Xinjiang and imported apples from New Zealand, America and Chile. The varieties include Gala, Red Delicious and others, but the most popular variety is Fuji, of course. The prices range from RMB5(\100) to RMB25(\500) per 500 grams for domestically produced apples at sale price, while RMB15(\300) is the average price for imported apples. 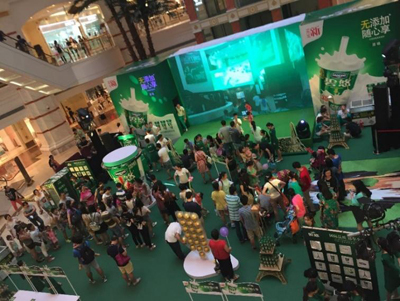 (As of October 1, 2015, the rate is RMB1=about \18.8. But prices are calculated RMB1 = \20 adding the exchange charge, etc.). The price varies depending on the retailer whether it’s a Japanese- or other foreign affiliated store. In China, groceries are usually sold by weight. The prices are shown per 500 grams, which I find very difficult to picture. 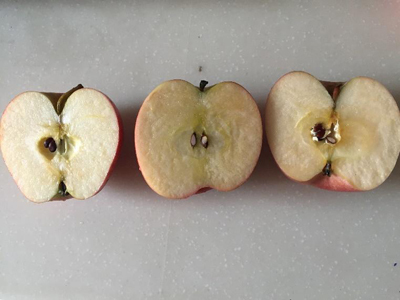 ▲Apples tasted are Gala (Chile) in the front, Jazz (NZ) on the back left, Fuji (Shandong) on the back right. I tasted a Gala from Chile, a Jazz from New Zealand and a Fuji from Shandong. Each weighed about 200 grams and the price was RMB6.35(\119), RMB8.35(\157) and RMB5.43 (\102) respectively. A Gala apple tasted bitter, which reminded me of a Japanese pear. The New Zealand Jazz was the sweetest among the three and it tasted a little like an over-ripened KINSEI. It may sound strange to you but it really was close to the taste of Kinsei to me. The Shandong Fuji has a tart flavor and, if I must choose, it is the closest to a Fuji from Aomori. 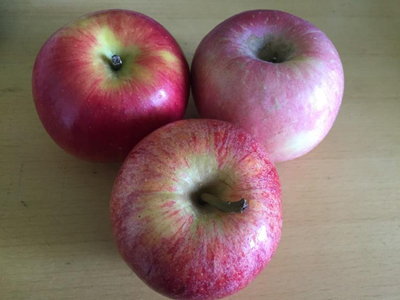 Overall those three apples lack a bit of tartness and crispness compared to Aomori apples. I wanted them to be tart because of my personal taste. I cannot stop thinking of Aomori orchards with red fruits in this season.